I’ve got a lot of projects floating around right now. Or maybe spiraling around is a better description because I find myself spinning at times. I have multiple personalities, flipping from one project to another with barely enough sense to change hats. My weird way of working takes me from one thing to the next with no logical sequence except that it is what I am feeling at the moment. The list of to-do’s is long and my attention span short so I just plug along, jumping up and down the list at will. It’s probably not the most efficient way to work but it works for me. This blog is one of my favorite projects. I have many stories to tell and recipes that I want to document. My blog is like my writing home, a place where I can keep my stories safe for the day when I might want to relive them. This story is a bit long, and a bit late in coming because it was meant for Hubby’s birthday which was ten days ago already, but here it is. I didn’t make Hubby his usual something special because this year my friend Jim Dodge said he was coming to visit and wanted to make Hubby a birthday cake. But Hubby doesn’t eat cake, so Jim ended up creating a Paleo Pavlova and it was way better than cake! Jim is a James-Beard-award-winning pastry chef and teacher extraordinaire so of course it was great. But Jim was just visiting, and he made up the recipe as we went along, so I have no recipe for the Paleo Pavlova. 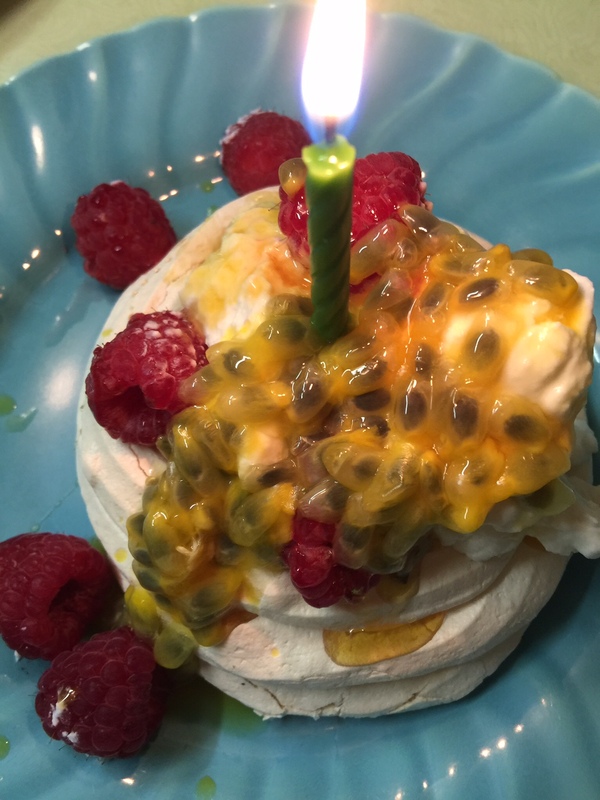 I asked another chef friend Nirasha, the owner of a new local food establishment called The Food Liaison, to make Paleo Pavlova for a second birthday celebration for Hubby and hers was spectacular too! It is my new favorite dessert. But I still have no recipe. Prior to the pavlova fest, I had been looking for something to bake for Hubby’s birthday. I was looking through my Grandma Flora’s cookbooks that my sister Julie sent me a few years ago. Grandma Flora, of Potato Chip Cookie fame, had 11 brothers and sisters…an even dozen kids in her family. Aunt Rhoda was the sister I heard about the most. 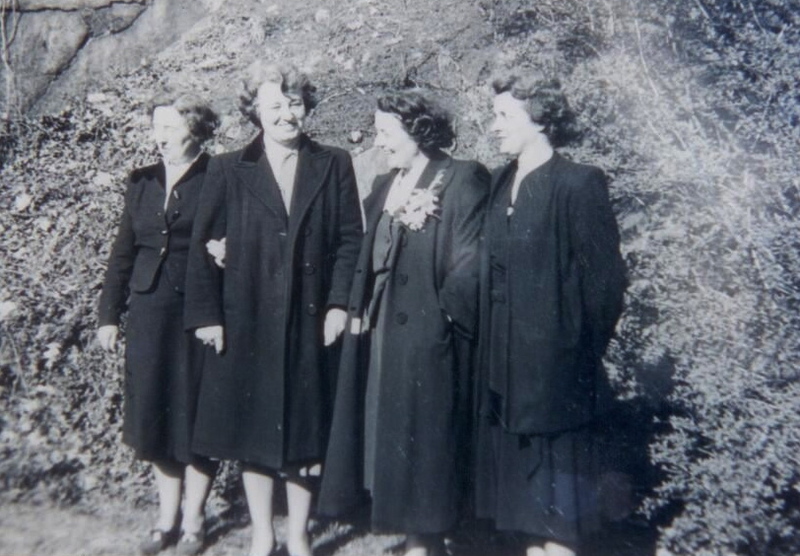 Rhoda and Flora kept in close touch, even through the years when they lived far apart and had rare opportunity for visiting. When Hubby and I lived in New Jersey in the 1980’s, my Brother Dave came to visit from California and we made a plan to go see Aunt Rhoda, who lived in Bay Shore, Long Island, and was our Dad’s favorite Aunt. Aunt Rhoda was a character. She had lived in the same house for 40 years and it was packed with 40 years of stuff. She had little stuff, big stuff, mostly old stuff. She was an artist and had paintings and supplies in every nook and cranny along with books and magazines and who knows what. We had a nice visit, a cup of tea and some laughs. We got up to go and Aunt Rhoda said, “But you must take something before you leave.” We didn’t understand what she meant. She said, “Take something. From the house. I want you to have something.” There was nothing we wanted and we had just come to see her and we didn’t know what to do. We resisted, and she insisted, and finally my brother picked up a little glass basket and said we would love to take it. And we did. We laughed all the way home in the car. My brother had taken the most gaudy, attrotious thing he could find. It was red with gold gilding and swirls of all different colors and it had no obvious function except as a decorative piece. Dave’s wife Shari said it wasn’t going in her house and I said it wasn’t going in mine and we laughed and laughed. But I made my brother take it home since he “chose” it. Not long after, a package arrived from Shari with a note thanking us for the wonderful time they had visiting us. I excitedly opened the beautifully-wrapped box, and couldn’t believe she had done it….there was the red glass basket. We traded the basket back and forth for years until Shari told me that unfortunately, it had been broken. The joke ended that abruptly but Rhoda and the red gilded glass basket live fondly in my memory. 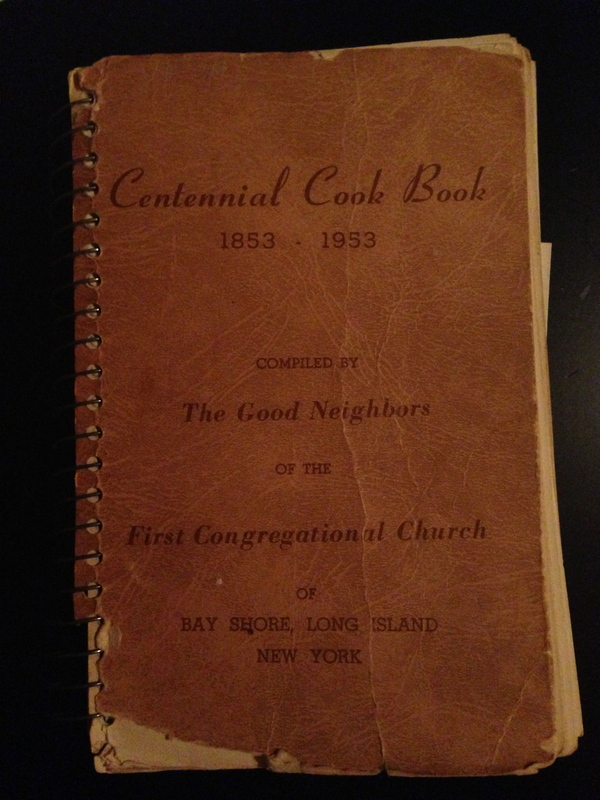 But back to my Grandma Flora’s cookbooks…I glanced through them looking for something to make for Hubby and realized that the two spiral-bound ones were from Bay Shore, Long Island, one 1953 and one 1975. I looked inside and discovered that Great Aunt Rhoda was the cookbook committee chair for both books, 22 years apart! And throughout the older book were lovely illustrations and drawings and cartoons signed by Great Aunt Rhoda. One recipe caught my eye. It had no author, unlike the dozens of other recipes in the books. But its wisdom is wise and funny. I like to think that it was added by the cookbook chair as a recipe that should not be forgotten whether speaking of spouses, partners, children, friends or relatives. It made me think of dear Hubby on his birthday. -Select the best man you can find and brush him carefully to rid him of any indifference. -Be careful not to beat him as you would an egg or cream, for beating will make him tough and apt to froth at the mouth. -Lift him gently into the home preserving kettle and tie him with strong cords of affection which are not easily broken. -Do not sear him with sarcasm for that causes sputtering which may ultimately result in spontaneous combustion. -Do not soak him in liquor, for excessive draughts will make him mushy and spongy with your friends. -It is best to let him simmer tenderly at will, to blend tactfully with dressing and seasoning. -Stuff him one hour before taking him out or before asking a favor of him. -Flavor him with oil of happiness, an ounce of understanding, and a bushel of fun and laughter. -Should he seem weak or troubled with feminine infatuations, smother him in onions and double your charm. -Do not spoil him by over indulgence, but serve him daily on a platter of strength and courage, garnished with clean shirts and collars. Loved Aunt Rhoda’s wisdom…dessert looks yummy, too! ← Virginia Willis says we should Lighten Up so let’s have Peach Soup!